Size/shape: 8mm round (spherical) with flutes. 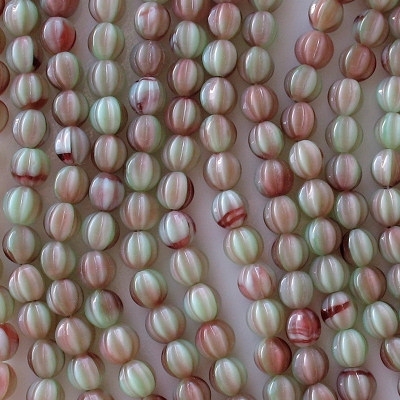 These are called "melon" beads by some sellers. Colors/description: Opaque light green with swirls of translucent cherry red. The red color might actually be fuchsia; it is hard to tell. Comments: These are premium beads at a very good price. They are gorgeous and very sophisticated. I didn't order them from the supplier immediately because their picture made the green look very light. It is light, but it turned out to be a perfect match for the cherry-red glass. When I restocked these beads in October, 2012, I applied my usual markup, and the price came out higher. I don't remember what I paid for these beads before, but it would seem that the supplier's price has gone up. 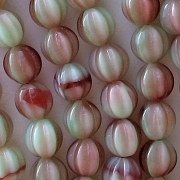 The supplier considers the "melon" shape to be a premium shape (not sure why), and all their prices for these beads are high. 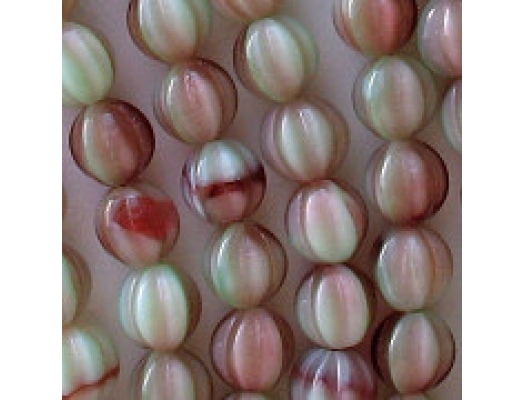 Important: In the new batch of these beads, the cherry glass is spread out more evenly over the green glass, so there are fewer areas of dark red (as can be seen in the photo, which depicts the first batch that I bought).